Two of our most popular camps can now offer a great authentic experience as well as a romantic one, with assistance from our expert team all the way to plan your perfect wedding. Imagine being in the heart of big game country and taking your vows under an Acacia tree. The ceremony is held in camp with a beautiful floral decoration, picked and prepared locally using indigenous plants and flowers, and you are welcomed by traditional Masai singing. 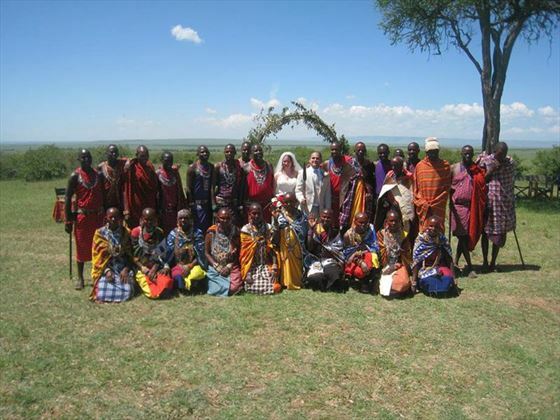 The Masai elders will also give their blessing to you completing this special occasion. The Camp staff will then present you with a wedding cake, made in camp, with a romantic bush lunch or dinner. 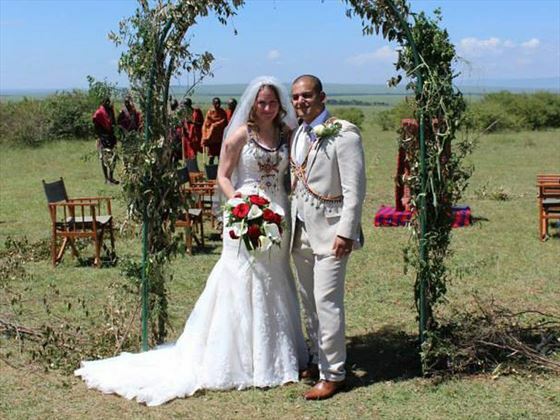 You can tailor the final arrangements to what you want to do on your special day – perhaps a game drive in the morning or a walk with the Masai, before returning back to camp for an al fresco lunch. You will then hold your ceremony during the quiet of the afternoon. 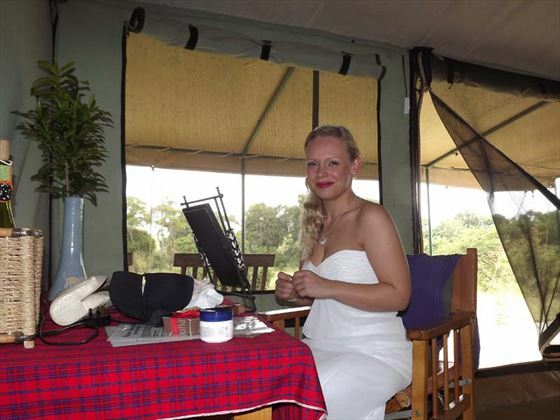 You will need to have two nights in Nairobi, as you will need to complete your wedding formalities and paperwork. After this has been arranged, you will depart from Wilson airport to the Mara. 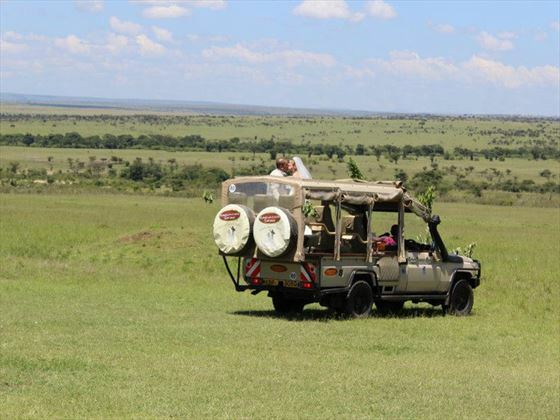 You’ll be met at the airstrip by your safari guide from Lion Camp in open-sided 4x4 safari vehicle and will immediately be “on safari” in the Mara. Enjoy a day in the Mara with a picnic lunch on the lookout for the Big Cats, then drive to Lion Camp and settle into your tent. Then, an afternoon game drive followed by a sun downer at a scenic point; return to camp for a shower, dinner and overnight stay. Awake at dawn to the natural sounds of Masai Mara’s birdlife. After early morning tea you will have a game drive in the conservancy on the lookout for the Big Five! Return to the camp for breakfast, followed by a morning walk across the plains escorted by Masai warriors before returning for lunch. In the afternoon you will go on a game drive in Olare Orok Conservancy, stopping for a sundowner at a scenic viewpoint, which is followed by a night game drive to look for nocturnal animals. Return to camp for dinner and overnight stay. This is your wedding day, so take time to relax as the big day has finally arrived. 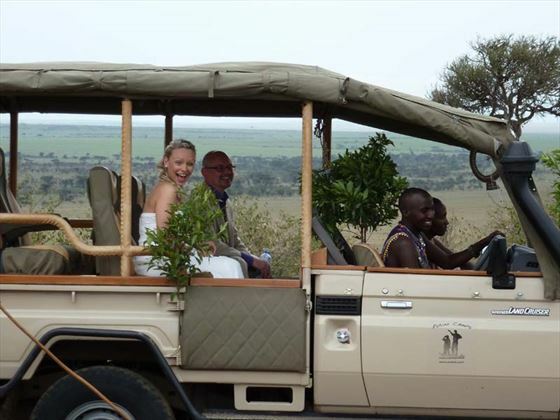 You can tailor the final arrangements to what you want to do on your special day, in the form of a game drive in the morning or a walk with the Masai, before returning back to camp for an al fresco lunch. 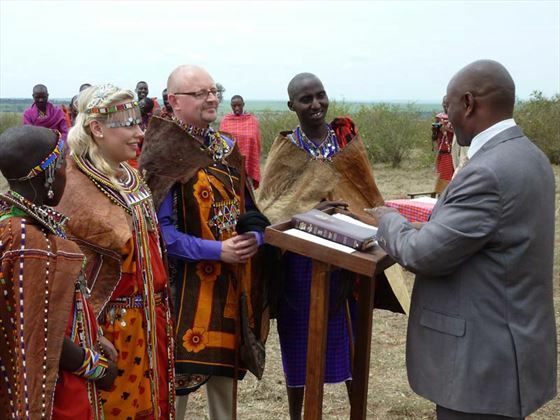 You will then hold your ceremony during the afternoon when the Mara is tranquil and calm. An early morning walk in the conservancy is followed by breakfast and then you will transfer to the airstrip for the flight to Nairobi, arriving Wilson airport at 12.15. Please remember that you will be travelling to the Mara via light aircraft with limited luggage allowance. Please take this into consideration when packing your wedding outfits.